As hellhounds continue to roam and the zombie plague spreads, Drav leads Mya to the source of her troubles - Ernisi, an underground Atlantis and Drav's home. There Mya learns that the shadowy demons, who've helped devastate her world, are not what they seem. Trapped in Ernisi, Mya tries to convince Drav to return her to the surface so she can continue her search for her family. However, he's determined to keep her where he knows she'll be safe. When Mya falls ill, Drav must choose between her and his people. Contains mature themes. Absolutely spectacular 2nd book in this epic series! Great Narrator as well as awesomely written. I love M.J. Haag’s works. This book is so worth reading. Can’t wait to listen to Demon Ash, so in love with these perfectly described characters. With Book One in the series, I read and listed to the audiobook by Dara Rosenberg. 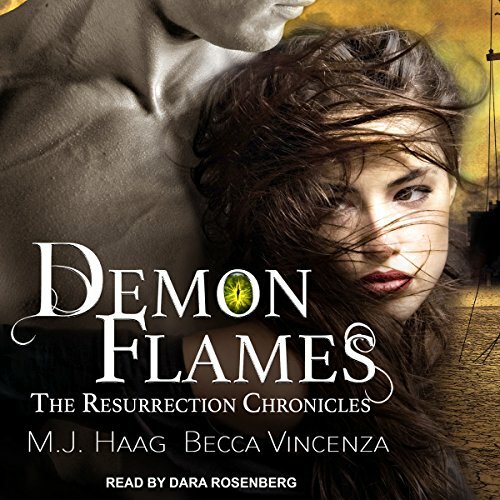 With Book Two, Demon Flames, I strictly listened to the audiobook. Rosenberg did a phenomenal job of bringing the characters to life for me. If possible Book Two was even more intense and Rosenberg brought forth all the feels. I look forward to checking out other work by her soon.